More than 60% of small businesses rate their bank’s onboarding capabilities as average or needing improvements in important areas, such as the length of the onboarding process. Business customers don’t have the time to fill out a time-consuming and complicated application and then wait days – or even weeks – to open a new account or to repeatedly enter the same information into separate application to obtain multiple products. The good news is that you can adopt the best practices proven by top banks to create a customer-focused onboarding experience and get it into the market before your competitors. 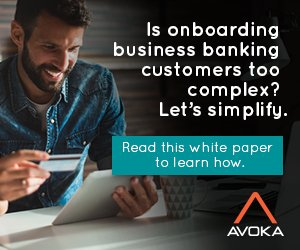 This white paper will help you understand how to build an optimized online business customer onboarding experience and get it to market fast – based on lessons learned by banks that got it right. Download ‘The bank executive’s guide to building a better business customer onboarding experience’ by providing details below. By downloading the white paper you agree to share your details with Avoka. Alpine Bank will modernise customer onboarding processes with Avoka's Transact platform. Six ways thin clients can improve your return on investment (ROI). How can you grow your fintech firm with a business software solution?